Friendly staff who are always up for a chat about anything whisky related - check. ..and following in the footsteps of many a great whisky bar, Mizunara can now also boast their own private whisky bottling - a 15 year old Arran bottled from a single sherry hogshead (the exact type of sherry we're not quite sure). The blokes at Mizunara were kind enough to invite me down for a dram recently, and I can honestly say they've picked a bloody good cask. Bottled on 8th August 2015 at 52.9% ABV, the cask follows the trend of a number of Arrans we've tried in recent years, in that they've all been high quality whiskies. 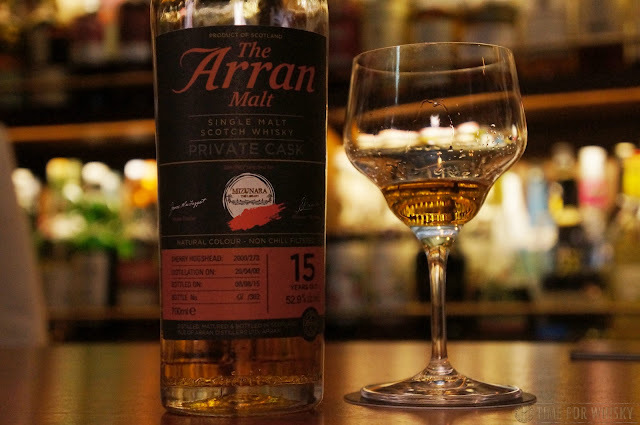 To be honest, years ago we weren't big fans of Arran, but they seem to have significantly improved since then, and we haven't yet tasted a single cask release that we haven't really enjoyed. The Mizunara team tried three samples (all from sherry hogsheads), before settling on cask 2000/273, which produced 302 bottles. Our full tasting notes are below, and it's available by the dram at the bar now. Nose: Classic sherry notes - lots of sultanas, stone fruits, Christmas cake, but also some lighter, fruitier notes - tropical fruits, especially rockmelon. Palate: Loads of sultanas, ripe cherries, some walnuts. Very smooth, and with no spice or unwanted "bite". Very "juicy", and with loads of malt character. 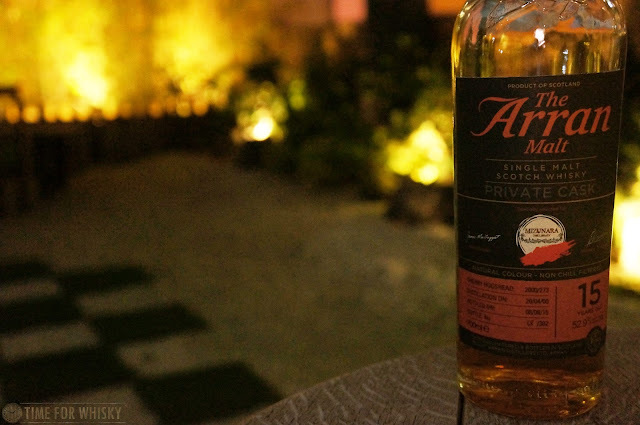 Water really increases the sweetness, as well as the malt, which really comes to the fore. Finish: Long and luscious. Malt, oats, cherries. Rating (on my very non-scientific scale): 92/100. A deliciously sherried single cask whisky from a distillery who have been churning out some cracking whiskies in recent years.